I’m happy to announce that this boy I saved 2 weeks ago is now eating and growing. Here’s a pic of him after a shed, what a beautiful boy with such a clean tail. I wanted to give a little warning to fellow leopard gecko breeders when introducing different males to the same female. This week we had a female that was clearly ovulating, so I introduced her to a male that I had initially planned the project for. The male rubbed all over the female, but he would not start the mating ritual. No tail rattling, no love bites, just a lot of tail & body rubbing. After about 10 minutes, nothing was happening so I separated the two, and placed them back into their enclosures. 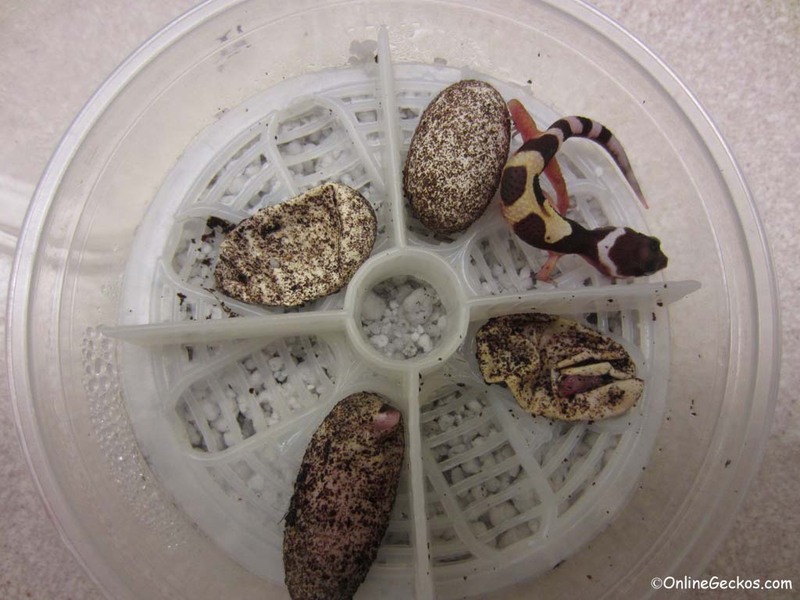 But what’s strange is that one egg down below, with what it would appear a gecko’s nose sticking out of it. 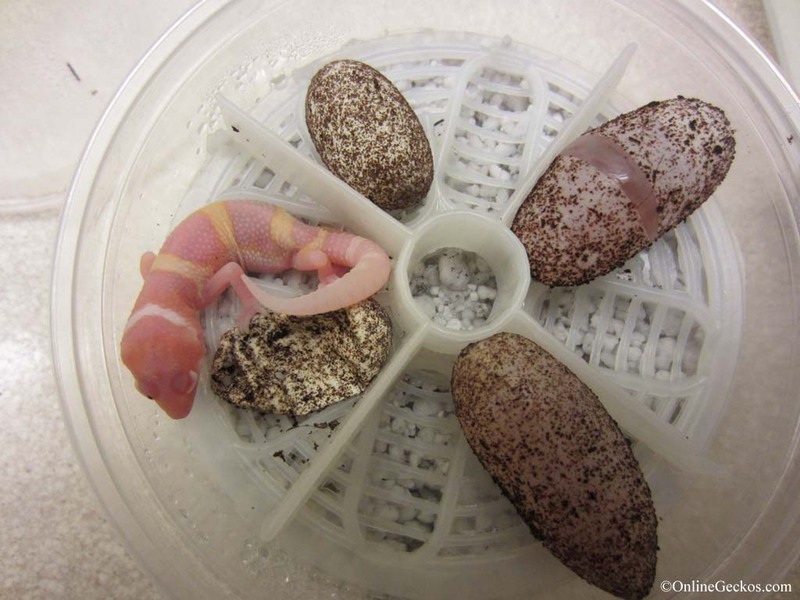 When I saw it, I thought the gecko was in the process of breaking out of the egg. So I put the cup back inside the incubator, and left it for a few more hours. In a typical breeding season, July is usually when your females stop ovulating and start eating again. This is also roughly the time when most breeders are listing their hatchlings and juveniles that are ready to be shipped. 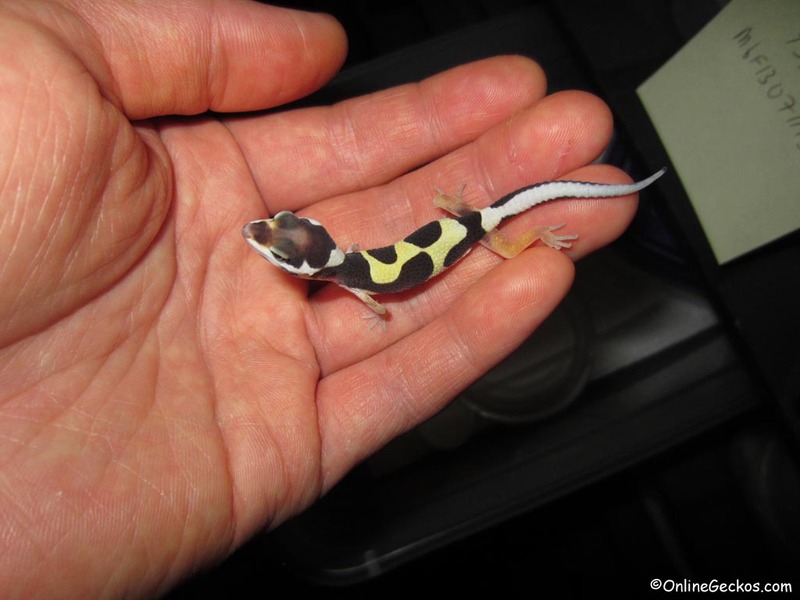 For us here at OnlineGeckos.com, this isn’t a typical breeding season for us. Our females for some reason decided to breed late this year, and many of them are still laying eggs. While our bold Bandit breeding group had a good jump start, majority of our other breeding projects have started late this season. We currently have about 30 eggs in the incubator, many of which would take another 30 days before they hatch. But, better late than never. Two weeks ago we posted a picture of a beautiful super giant raptor female that hatched. Today we had another super giant raptor hatch, this time a male. 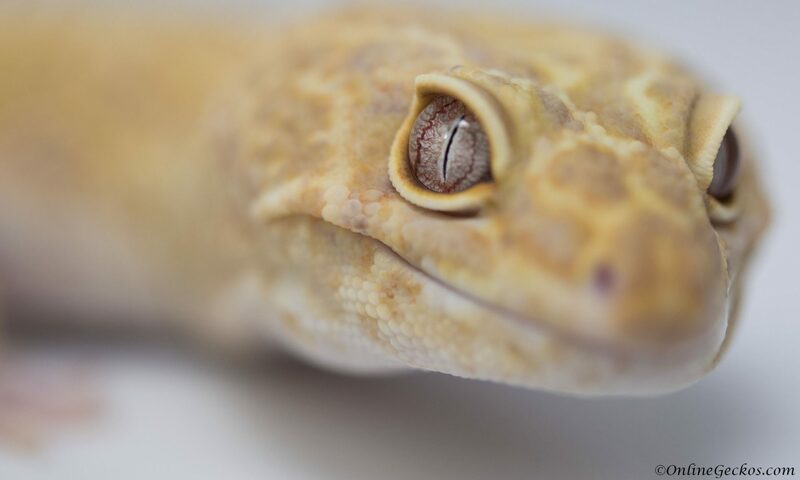 Take a look at this beautiful gecko.